The newly refurbished Elaine Thomas Library on the University for the Creative Arts Farnham Campus is designed to integrate the needs of disabled students. The library is an extension of the studio environment, with dedicated spaces for individual and group creative work. As well as an extensive range of specialist books and electronic resources, the library acts as a gateway to the full range of support services available, including counselling, dyslexia support and financial advice. What makes UCA’s redevelopment of its library stand out is its unwavering commitment to integration of the university’s high proportion of students with disabilities. Given UCA’s strategic aim of attracting people with disabilities to its undergraduate and postgraduate programmes – and its longstanding relationship with nearby school for the severly disabled, Treloar College – the redevelopment of the Farnham library space came with a very specific set of challenges. In conjunction with the client and lead architects DRDH Architects, Bruynzeel Storage Systems developed and installed a range of user-friendly electronically powered mobile storage systems to house the library’s 70,000-plus store of books that would allow access for all – including those in wheelchairs. Following detailed consultation, the mobile storage systems were planned with non-standard extra wide aisles. At 1800mm, these not only allowed full wheelchair access, but allowed a large enough turning circle to accomodate motorised wheelchairs, such as the one used by MA student Fay Hart (pictured). All shelving units, whatever their load, move instantaneously if required. The control panels can been sited at low height enabling the button to be reached by wheelchair users. 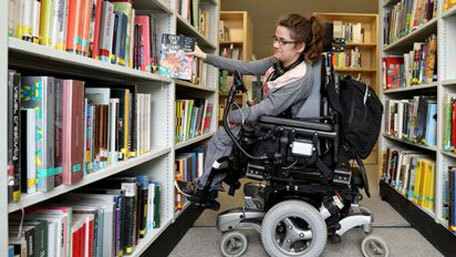 “A lot of the existing shelves were too narrow, but I can get in the rolling stacks,” said student Fay Hart, whose Cerebral Palsy has not stopped her completing undergratuate and MA studies at UCA. More photos, information and technical data on the Bruynzeel website.